Elizabeth Murray Campbell (age 33) and her second husband James Smith (age 70) lived at his beautiful 300-acre estate called Brush Hill from the time of their marriage in 1760 until his death in 1769, at which time the property became hers. (See posts concerning Elizabeth Murray here, here, and here.) When the widowed Elizabeth went abroad in 1769, her brother James lived on the estate. 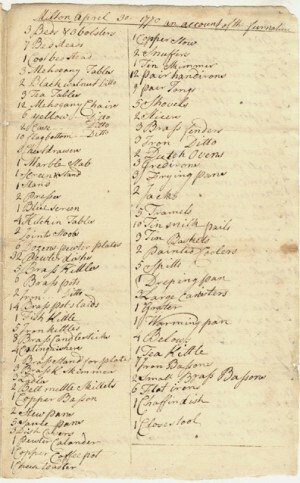 Here is an inventory of the furniture in the house, taken in 1770. I confess I enjoy perusing inventories; the objects listed convey a sense of the kind of life the occupants of the house lived. I find the number of items related to food preparation and dining in this list particularly interesting: among them a pewter Calander, a cheese toaster, a Copper Coffee pot, 5 Tramels, 4 Bel[l]ows, and 1 Chaffin dish. An impressive collection, indicative I suspect of extensive entertaining. One item mystifies me: “4 extinguishers.” They are not snuffers as I originally thought as two of these are listed in the second column. Any ideas? If you are having difficulty reading the manuscript consult the TRANSCRIPTION provided by the fabulous Elizabeth Murray Project. In the previous post black scholar Henry Louis Gates referred to a verse of Phillis Wheatley’s as “one of the most reviled poems in African-American literature” because in it Wheatley excuses the system of slavery on the grounds that it allowed her to become a Christian. This view seems to have been fairly common among slaves who became devout Christians, and among white Christians as well. I came across a memoir recently which expresses this same sentiment. Chloe Spear was a slave whose memoir was written in 1832, some seventeen years after Chloe died, by “A Lady of Boston”, a member of The Second Baptist Church in that city, tentatively identified as Rebecca Warren Brown. It describes how Chloe became a slave and what happened to her. The author had known Chloe and her story, but she editorializes throughout her account making it difficult to distinguish truth from conjecture and opinion. About seventy years ago, on the coast of Africa, the subject of the following memoir, in company with four neighbouring children, herself the youngest, according to the statements from her own lips to the writer, resorted to the shore for amusement, either by bathing in the cooling stream, or other playful sports to which they were accustomed, with the full expectation of returning to their several homes, as usual, after such seasons of childish diversion. While engaged in these innocent and healthful recreations, they were suddenly surprised by the appearance of several persons, who had secreted themselves behind the bushes: they knew not what to imagine they were, having never seen a white man; from whose frightful presence they attempted to shrink away, but from whose cruel grasp they found it impossible to escape. Not withstanding the piteous cries and tears of these poor defenceless children, they were arrested by cruel hands, put in to a boat, and carried to the dismal Slave Ship, which lay off a few miles in the river, the horrid receptacle of a living cargo, stolen from its rightful soil, by barbarous hunters of human prey for the purposes of traffic. Terror and amazement, as may be supposed, took full possession of their minds. Every thing around them was as novel as it was dreadful. A ship, they had never before seen; the language of these strange intruders was perfectly unintelligible to them and their intentions they were unable to comprehend: and no tender mother, no avenging father near, to know or to alleviate their wretchedness. Ah! little did these hapless children realize, when they quitted their native huts and frolicked, away to the woody beach, that they had left, for the last time, the places of their birth, and the fond embraces of their parents and brothers and sisters. . . . We can better conceive than express the feelings of their parents and friends when night came on, and the looked for children returned not. Silence has ensued, from that to the present hour. From their injured children, they heard no more. . . . The cruel separation being made, and the terrified, weeping victims packed on board the floating prison, her sails are bent, and she bears them from Africa’s romantic wilds, never to return. . . . The length of the passage is not known; the end of the voyage, however, brought them to Philadelphia. . . . Here, another painful separation was to take place. Hitherto the children had remained together, nor does the writer recollect to have understood that they were beaten, or otherwise cruelly treated, as many others have been. But now they were to be disposed of like cattle taken to a Fair, to the highest bidder. At the time they were exhibited in the market, the subject of our little history, whom, she said, the sailors used to call Pickaninny, on account of her being the smallest of the lot, was sick; consequently she did not meet a ready sale. The others were sold, she knew not to whom, and carried she knew not whither. . . . She . . . was subsequently purchased by Mr B. and brought to Boston, Massachusetts. Foul stain on the character of our beloved New-England! She did not know her age, but from her appearance she was judged, she said, to be about twelve, at the time of her arrival. But, young as she was, she remembered various particulars respecting her country, such as climate, fruits, traditions, &c. And having always been accustomed to warm weather, she could not be made to understand what was meant by winter; and when told that, at that season, water sometimes became so hard that it could be cut with an axe, she was astonished and quite incredulous. When winter came on, and she first saw the falling flakes of snow, she was highly amused and playful. And as the season advanced, and produced to her senses the solid ice, she found, by ocular demonstration, that the assertions she had heard were indeed true! Although enlightened and good people must always have known, that it was a barbarous and wicked thing to take their fellow-beings from their native land, and bring them to ours, to sell or buy them for slaves; yet it is well known that then there was less knowledge of its wickedness than there now is. Hence we are willing to believe, that if the master and mistress of this poor, oppressed girl, whose story is here related, and whom they named Chloe, had lived in our day, they would have dealt very differently by her from what they then did. But at that time, here, as now in many parts of the world, slaves were considered property, and their owners thought themselves under no more obligations to instruct them, otherwise than to do their work in such a manner as best to subserve their own interests, than farmers do, to take, their horses and oxen into their houses, instead of the pasture or the barn. With such views, it is not singular that Chloe was taught nothing, comparatively, of her duty to God, nor to read the blessed Bible. . . .
More about Chloe in the next post. Memoir of Mrs. Chloe Spear, A Native of Africa, Who was Enslaved in Childhood, and Died in Boston, January 3, 1815. . . . Aged 65 Years by A Lady of Boston. 108 p., 1 ill. (Boston: Published by James Loring, 1832) DIGITAL EDITION, University of North Carolina at Chapel Hill, 2000. The illustration is the frontispiece in the book. Papa, your husband [Peggy’s brother Elisha], and myself, were for the former : Mr. C[larke], and Billy [Peggy’s brother William] for the latter. I own I still feel a partiality for my native country. Papa could not help expressing his in very strong terms. Mr. C. said he never should lose the idea of the last winter : that the injuries he then received were too strongly impressed upon his mind ever to be erased. I told him I was surprised to find his affections so alienated from his country : that I thought the friends he had there, if nothing else, must make the place dear to him : and, as to climate, surely, said I, we have the advantage. They would neither of them allow it, but said the extremes of cold and heat were enough to ruin people’s constitutions. I, in return, had no mercy upon this, but exclaimed against it as cold, damp, dirty, and altogether disagreeable, and declared that I could not take a breath of air, but it gave me a cold and cough, which immediately fixed upon my lungs : and that if I lived here fifty years, I never should be reconciled to the climate, or to living in London; but could not but allow that the country was exceedingly beautiful, and struck me beyond anything I could imagine : but that only served to tantalize, as the ground was always so wet, (even in the middle of summer) that it was impossible to enjoy it by walking. We carried it on till it was time for them to go to the Play : and I believe Mr. C. was glad to get off with a whole skin. How happy should I be to see that country restored to a state of peace and quiet! not so much for my own sake as papa’s, who I think will be happier there. . . . In a later letter Peggy writes “What joy would it give me if [Papa] could be the means of restoring peace to his native country, but I see no prospect of it : you are bent upon destruction.” Thomas Hutchinson’s attempts proved futile. The letter can be found in The Diary and Letters of Thomas Hutchinson, Vol. 1, HERE, pages 276-77, 278.